Hello shopaholics! I found a product I can recommend to you. 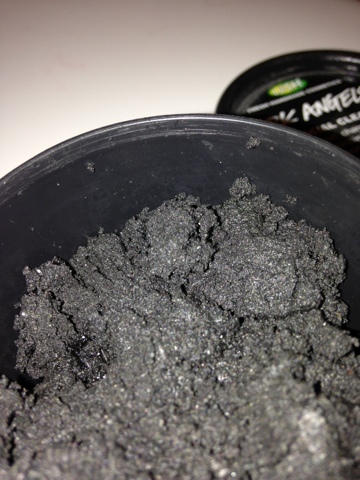 It's Dark Angels from Lush. It comes in of of their re-usable pots and last forever, I would recommend to use this product twice a week for best results. It is quite fun using this product as you have to take a small amount (as shown in the middle photo) and blend it with some water in your palm and massage it onto your face (make it wet first) and then keep on massaging for a few minutes for best results. 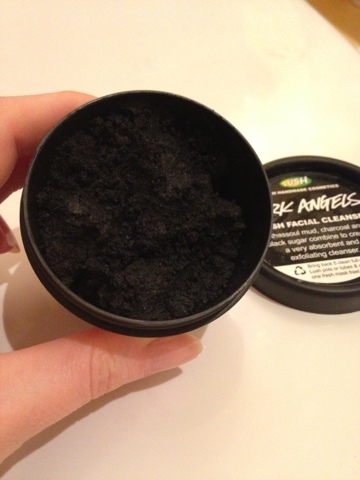 It contains grains of sugar and charcoal and is perfect for oily skin making it super smooth. The fun part is that you look like a dark angel while using it but don't be scared, it is worth it! It can be messy using it so make sure you rinse thoroughly and don't use white towels afterwards. If you are a blonde it's best to use it just before you wash your hair. 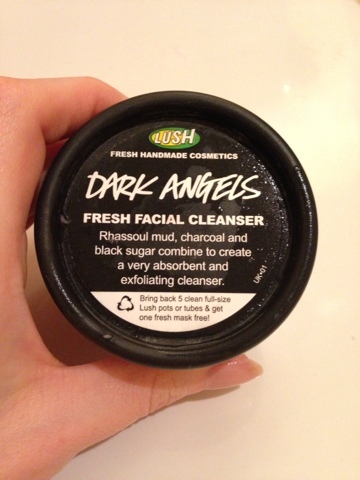 Here it is Dark Angels facial cleanser. 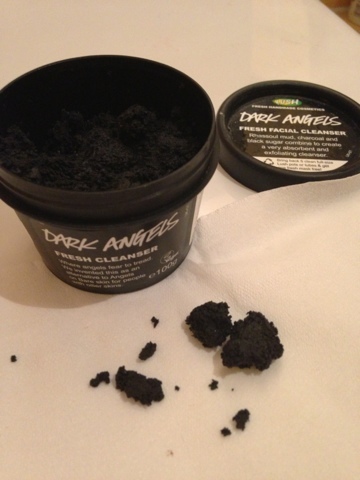 One of many great products from Lush, fresh and handmade cosmetics (you can see how some of the cosmetics are made in little videos which is very interesting!). I will write some more product reviews soon. Follow me on Bloglovin', Twitter or by signing up by email. Wow, i'm very curious about it! I've to try it. Your blog is very beautiful and clean! Hey thanks for sharing, I might try it product!